Hello!! I have carved out 15 minutes in today’s study schedule to blog because 1) I really miss it, and 2) I might actually walk outside and step in front of an oncoming T if I don’t do something to break up the monotony of practice essays. In case anyone is keeping track, day one of the bar exam is one week from today, and day two is one week from tomorrow. That means: 1) I have been studying for this test to the exclusion of pretty much everything else for 50 days now, 2) at 4:30 p.m. on July 28 (193 hours from now), I will be freed from my misery, and 3) I will finally be ready to publish posts I have been compiling for the last two months regarding my eating habits during the period, which have been both erratic and ingenious at times. It seems I am no longer capable of putting thoughts into words without using numbered lists. Though it’s sort of hard to remember what my life was like before the bar, I have this dim recollection that I was a happy and social being. In fact, sometimes I even bathed and left the house, occasionally to go to (gasp!) parties, and when I did, I used to like to bring vegan treats along to generously share with those present, as well as to selfishly ensure that I would have something to eat. Way back in May I went to H’s sister’s confirmation party and made the Mediterranean Cashew Cucumber Dip from Veganomicon. This stuff is so amazing. 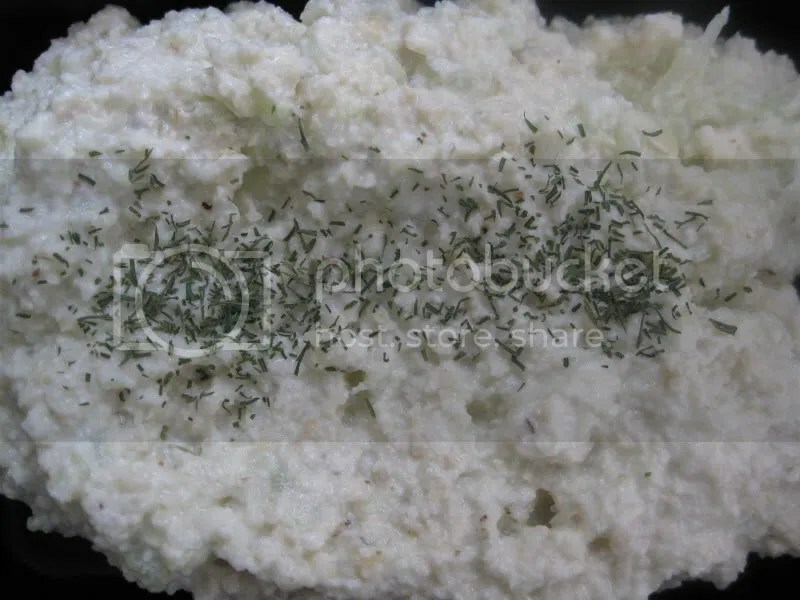 It tastes just like tzatziki but has the texture of hummus, and is perfect for dipping veggies or pita chips in, or for spreading on crackers. This container got totally eaten up. Proud Cook. More pictures from when I made the dip back in 2008. 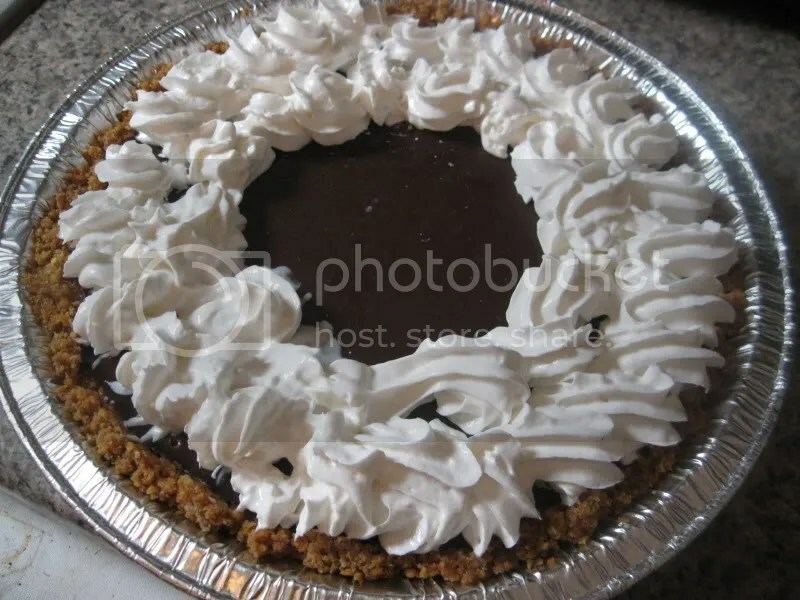 In June, when I hadn’t yet metamorphosed from well-adjusted human to Gollum, I also went to H’s other sister’s high school graduation party and made a Chocolate Cream Pie. 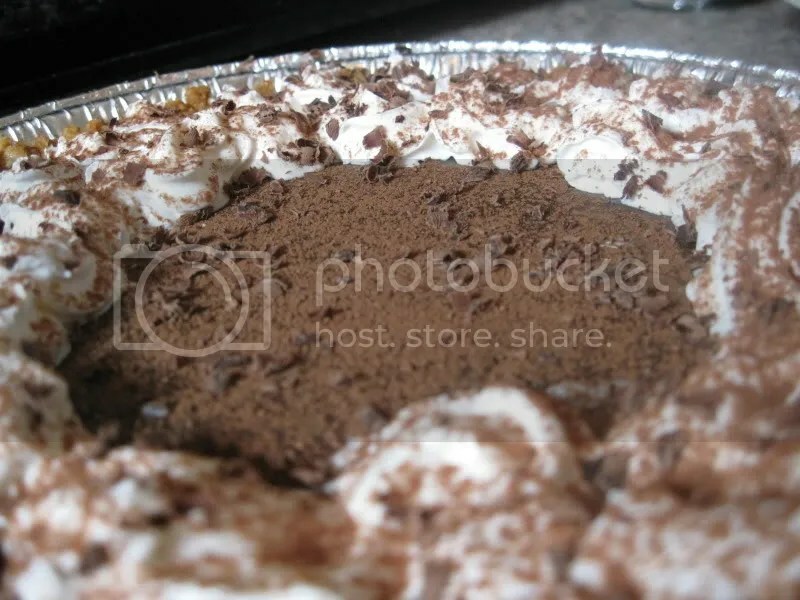 This pie was super, super simple. 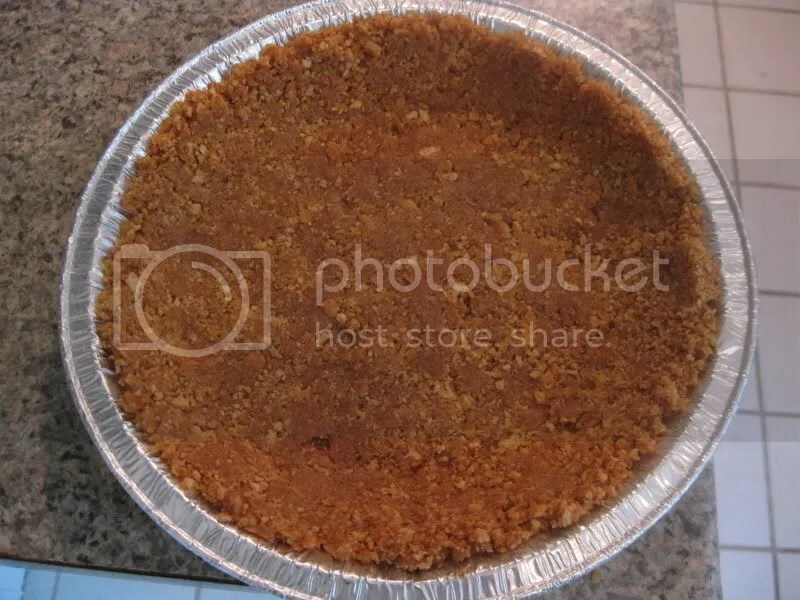 First, you make a graham cracker crust, from whatever recipe you like. I used this one, because it’s foolproof, and subbed Smart Balance for the butter. Then, I made the filling. I used Dr. Oetker’s Organic Chocolate Pudding Mix (which I bought at Whole Foods). 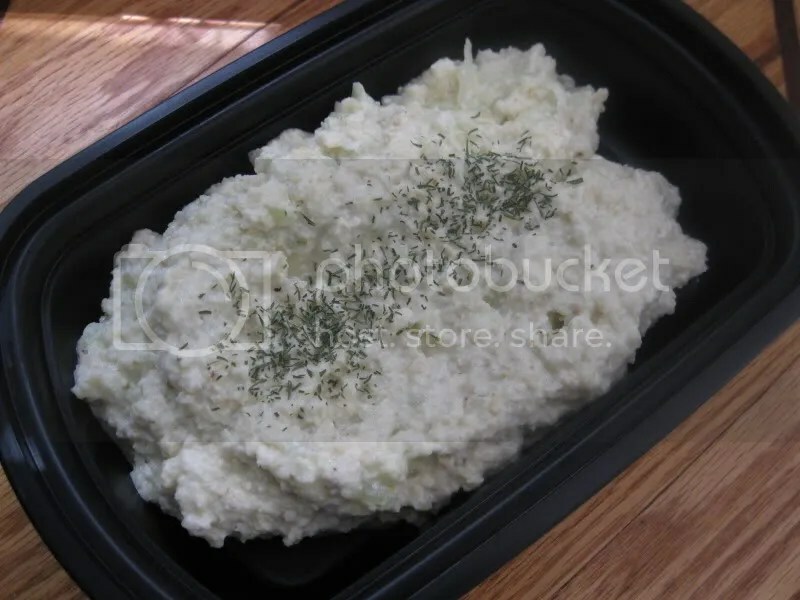 I cooked it on the stovetop according to the package directions, using vanilla soy milk. 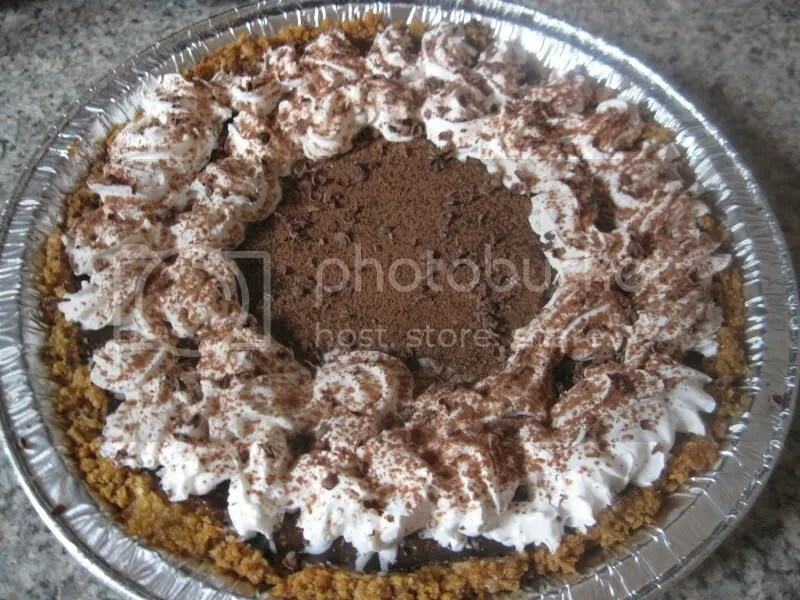 Next, I poured it in the pie shell and let it chill. After I took it out, I topped it with Soyatoo. I actually didn’t do the entire thing because I ran out! But I still think it looked kind of nice. Finally, I dusted it with a little cocoa powder, and shaved part of a dark chocolate bar over it. Everyone at the party knew me, that I’m vegan, and that I’d brought the pie. Those who had sampled my cooking or baking before (and there were quite a few) were happy to try it, but the rest steered clear and went for more familiar fare. Oh well. You can’t force people to step out of their comfort zones, and on this particular occasion I didn’t try, because it meant there was more pie for me. Win. 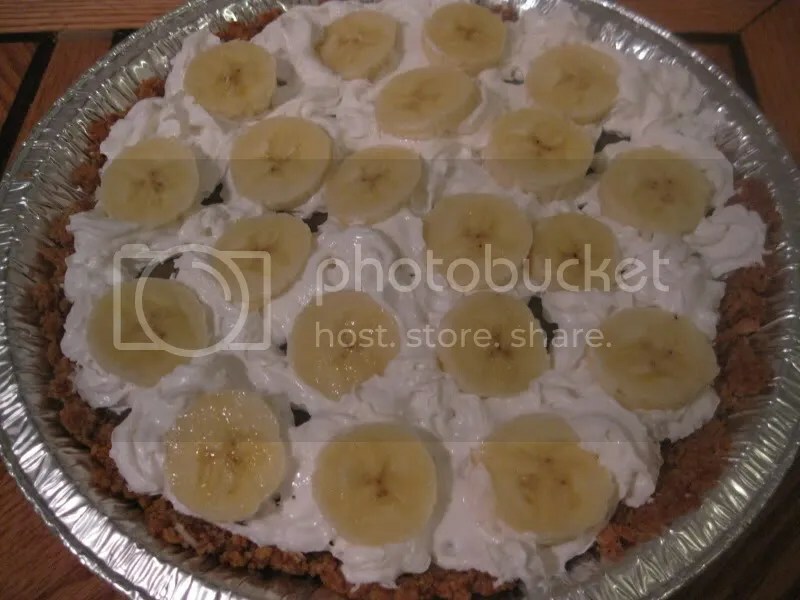 Since I just talked about the chocolate cream pie, I suppose this would be a good opportunity to post pictures of the Banana Cream Pie I made a few months back too. It’s the same exact thing as above, except I used Dr. Oetker’s Organic Banana Pudding Mix and sliced fresh bananas on top. And photographed it at night in my dim kitchen, so the picture isn’t great. I made it for dessert for H and me and we ate it for about a week. It was good! 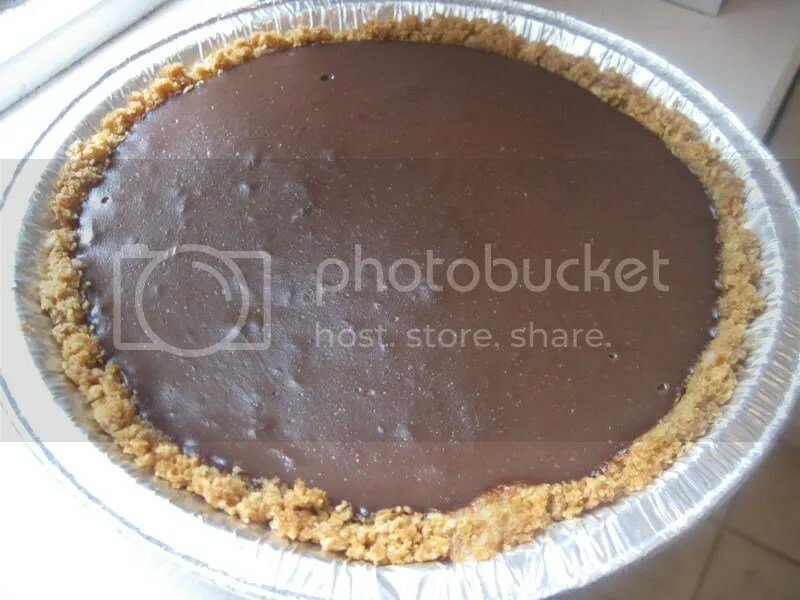 Next time I definitely want to add pieces of Mi Del Vanilla Snaps (in place of disgusting Nilla wafers) into the filling. Overall, I recommend this pie method as an easy shortcut to a yummy and not horribly unhealthy dessert, whether you choose to share or not! Alright, break time is up (and of course it took me 40 minutes instead of 15 to put this together)! But the next time I post, I will be doing so as a free woman. Perhaps it will even be coherent. Stay tuned.